BERNE, Ind. -- DRG is partnering to promote breast cancer awareness through a series of pattern books called Think Pink. The books feature a variety of patterns in pink, inviting needlecrafters to join in the effort to identify a cure. Indiana University Simon Cancer Center Assistant Director of Development Theresa Vernon (left in photo), Cancer Center Development Director Mary Maxwell and DRG Public Relations Manager Nancy Brown display pink cancer awareness ribbons and a copy of Quilter's Think Pink during a recent visit and tour at the DRG publishing office in Berne. DRG has pledged a portion of the proceeds from each Think Pink book to research through the Indiana University Melvin and Bren Simon Cancer Center in Indianapolis, Ind., dedicating Think Pink to all the women who have faced the difficult challenges of breast cancer. 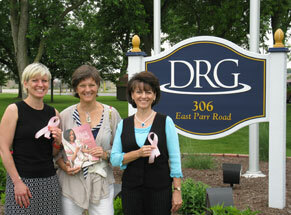 Over the past two years, DRG has given monetary gifts totaling more than $10,000 to the IU cancer center. In addition to Quilter's Think Pink, which is available through the Clotilde catalog, there is also Think Pink in Plastic Canvas and Think Pink: Crocheting for the Cure, both available from the Annie's Attic catalog. Products used in the Think Pink books can be purchased from local craft, fabric and variety stores or from the two DRG catalogs, available online at Clotilde.com and AnniesAttic.com. Annie's Attic and Clotilde are leading DRG brands. Other brands include The Needlecraft Shop, House of White Birches and American School of Needlework. Needlecrafters can also access the catalogs from the DRG Web site at DRGnetwork.com, where information is available about additional books, magazines and pattern booklets produced through the company's publishing division. About DRG: DRG (DRGnetwork.com) is in its third generation of Muselman family ownership in Berne, Ind. The company consists of a direct marketing division, featuring craft and nostalgia products, and a marketing services/fulfillment division in East Texas. DRG publishes magazines and books, and also offers kits and supplies under consumer brands that include House of White Birches, Annie's Attic, Clotilde, The Needlecraft Shop and American School of Needlework. Most print products are also available for download via the Internet. The fulfillment division, Strategic Fulfillment Group (SFG), in Big Sandy, Texas, offers database marketing and Internet services alongside traditional subscription and product fulfillment.